Valerie Landau checks angle with Cameraman Jeff McCall. Valerie Landau worked as associate producer for PBS stations KTEH and KQED as well as freelance for video and film projects. She served as field guide for film crews in Cuba during the 1980s including CBS's 60 Minutes investigative reporters Lowell Bergman and Harry Reasoner in 1989. She also worked with The ARD, German public Television, on three documentaries: Tropicana, El General, and Cuba. She also worked for VIL films on a documentary about Fidel Castro called The Uncompromising Revolution in 1988. She also worked for the legendary singer Paul McCartney as the pre-production producer for his Latin American Tour in 1993. While at KTEH she served as producer of the documentary video Back From Nicaragua , staring Pete Seeger, Joan Baez, and Holly Near and as Associate Producer of the award-winning three-part series Silicon Valley. At KTEH she was associate producer for The Other Side of the Freeway about the unsung heros of East Palo Alto. She also served as an educational consultant to Short Stories and Tall Tales. Latino, a feature film directed by Haskel Wexler released in 1984 by LUCASFILMS, Actress, Segment Coordinator, and voice over. Valerie Landau worked with other media professional through Creative Media Professionals and worked on several projects including training videos for Mervyn's. She is currently creating a video archive about the work of Dr. Douglas Engelbart, The Engelbart Chronicles. Silicon Valley Award-Winning TV Series. Valerie Landau served as Associate Producer for the Silicon Valley documentary three-part TV Series. The Silicon Valley series includes interviews with leg ands such as Steve Jobs, Gordon Moore, Steve Wozniak, Robert Noice, and hosted by Mike Malone. Valerie Landau and Nina Serrano are co-producers of Back From Nicaragua, a documentary about American musicians who traveled to Nicaragua and brought a message of peace during the Contra War. Back From Nicaragua was shown on PBS stations and selected in the Mill Valley Film and Videofest, 1986. The video featured legendary singers folk singers Pete Seeger, Joan Baez and Holly Near. 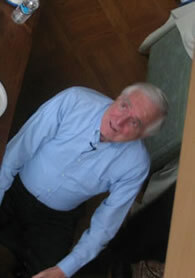 Douglas Engelbart @ his home in Atherton CA, 2004. Valerie Landau is producing The Engelbart Chronicles, a collection of interviews with and aobut Dr. Douglas Engelbart. Some of these interviews are availble in an online archive designed by California State University, Monterey Bay student Rebecca Sheranian.